In Holland some initiatives exist on architectural education for youth, but the most outstanding is 'Building Dreamhouses in the Beurs of Berlage'. Every year, somewhere in november, children at the age of 7-12 are invited at the Beurs of Berlage to build there own dreamhouse. 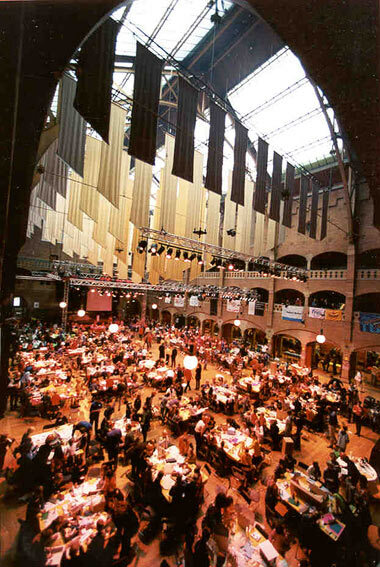 In the intimidating historical space, designed by the famous Dutch architect Hendrik Berlage, about 600 kids gather for an exciting day in this world of architecture. 60 Tables are set with building material, like karton, foam, etc. supplied by several sponsors. At every table an architect with a coloured building helmet, will welcome a group of ten, guiding them during the day. After an opening of music and a slideshow of real and imaginary examples the kids can start building. A special team of handy-man is equiped with knives and scissors to help the kids transforming the material. And limonade-girls, dressed in silver, equiped with a limonade-drip, walk around to provide the drinks. Parents are not allowed on the floor. For a small fee they can enter the galery above to watch the progress on the working floor. At the end of the day a jury will make a selection of ten dreamhouses, which will travel as an exhibition through the country. In 2001 the organizers won the Prince Bernhard Culturefund Price and since may 2001 there is an audiovisual education package, Dreamhouses and Aircastles, for schools available. The initiative has lead to simular succesful projects like 'Rotterdam Bouwt'.